Phil Housley, left, and Jason Botterill are now in charge of the Sabres (James P. McCoy/Buffalo News). What this comes down to is respect. Phil Housley will forever have three words in front of his name that mean everything in the hockey world. "Hall of Famer" carried plenty of weight in the Nashville Predators dressing room. P.K. Subban loved Housley. Roman Josi didn't know of Housley growing up in Switzerland but quickly found plenty on YouTube that filled him in. Ryan Ellis and Mattias Ekholm blossomed into studs. Sabres General Manager Jason Botterill knows his players will go through the same exercise with their new coach. Most won't remember Housley's playing days, especially his eight years with the Sabres during the 1980s. Some may not have heard of him until he became a hot name in Nashville. 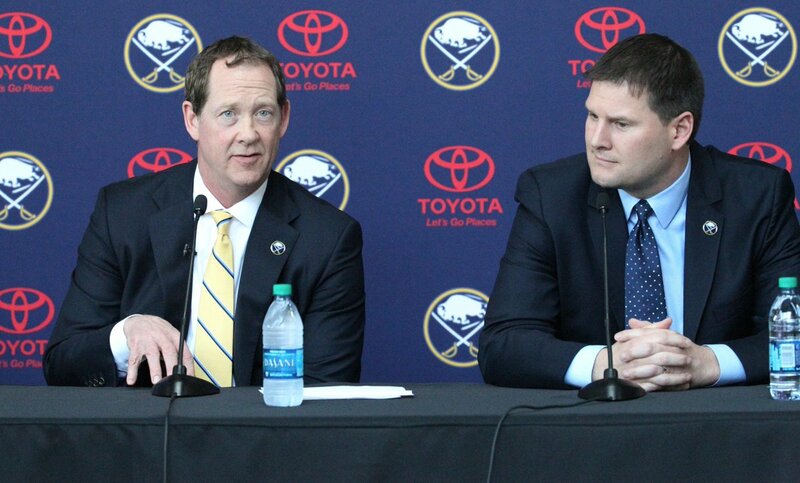 "There is that credibility right off the bat," Botterill said Thursday in KeyBank Center after the news conference introducing Housley as coach. "Even with talking with Phil, he doesn't just rest on that. He may have credibility but you don't back it up, you're not helping them get better and it's going to dissipate very quickly. "That's what I liked about Phil. He touches on that, that there's a respect level right away. ... Talk to anybody. His preparation, his detail for his meetings really come across to the players and they realize he's out to help these guys achieve their goals." This isn't a hiring rooted in Terry Pegula's nostalgia of watching Housley from the Reds in the Aud. (Memo to Pegula: Stop saying you're a "new owner." You bought this team in 2011). This is Pegula putting a solid stamp on Botterill's strong first decision as GM to hire one of the game's rising assistants and make him an NHL head coach for the first time. And it's a decision that should resonate throughout the Buffalo dressing room. Come September when training camp opens, the heat will no longer be white-hot on the general manager. He's new. It will no longer be last-chance time for the coach either. He's new too. There will be no waiting on a firing to bring some magic elixir to a troubled franchise. The pressure will all be squarely on the players. Some of them will be new. Many of them will be the same familiar faces, a group of whom were largely responsible for the running out of Dan Bylsma and what turned into the surprising sacking of Tim Murray. These players didn't respect Bylsma nearly enough, even though he had a Stanley Cup on his resume. They didn't like Byslma's communication skills, and his playing career as a fourth-line plugger didn't engender much reverence either. Now they have a first-time NHL head coach, a guy who was coaching high school hockey four years ago but quickly ascended the ranks to be a key assistant for a Stanley Cup finalist. He's a Hall of Famer, and one of the legends of the franchise. Housley answered questions in rapid-fire fashion Thursday. He knew the talking points he wanted to put in the public domain. Speed. Attack. Five-man unit. They were, frankly, many of the same ones Bylsma used a little more than two years ago. But what was most interesting was how Housley said he wanted to get through to the young players, especially Jack Eichel. Housley, remember, had a front-row seat for one of Eichel's signature moments in the just-concluded season: The thrilling end-to-end rush that produced the overtime winner in the Sabres' victory over the Predators in January in Bridgestone Arena. Housley said he hopes to build the kind of relationship with Eichel that Bylsma failed to do. And he reminded you he did exactly that over the last 12 months with one of the biggest stars in the game. "PK Subban was a tremendous personality and I think I can use that experience trying to get to Jack," Housley said. "... He's a terrific talent and I'd like to get the most out of him." It's time to listen to the coach. It's time to play the way he wants them to play, not the way they want to play. It doesn't matter if you're a plugger like Zemgus Girgensons, a prospect like Justin Bailey, a veteran like Tyler Ennis, a big money man like Ryan O'Reilly or the anointed one like Eichel. The coach and the general manager run the team. The players do not. Let's repeat that all summer: The coach and the general manager run the team, the players do not. This is now The Botterill and Housley Show. Anyone wearing the sweater who doesn't want to line up behind them -- not in front of them -- may as well approach Botterill right now and ask out. There are plenty of moves that can be made in advance of the expansion draft. This franchise let the players run the team last year and it got them a 78-point season that turned them into a scourge in the hockey world. In hindsight, ownership probably did a prudent thing with a clean sweep and it remains to be seen how many of these guys will be around come September. And at the risk of drawing conclusions while reading tea-leaves, it was awfully interesting that Housley didn't mention Sam Reinhart or Evander Kane during his press conference or his interview with WGR Radio. Maybe it was an omission, maybe it wasn't. Maybe there were messages there. Still, job one for Housley is to get through to Eichel. Bylsma didn't and that was pretty much that for Bylsma in Buffalo. Cut to the chase: If Bylsma was liked by Eichel, he would still be the coach. Now it's Housley's turn. Maybe this is a Steven Stamkos situation. Barry Melrose didn't know what to do with Tampa Bay's star in 2008 and got an early sacking. Rick Tocchet started to get Stamkos in the right direction and then Guy Boucher and Jon Cooper turned him into the superstar everyone expected him to be. Maybe Housley can do that here as well. He's the coach. It's his team now. Maybe this season, the guys wearing the skates and hitting the ice will remember that.